The human body is many things, but among others it is a source of information and a barrier to communication. We are social and not merely gregarious beings because our body is a boundary across which what is exchanged between our minds has to pass: states, emotions, thoughts, desires and convictions, projects, affiliations and loyalties, lies and betrayals, loves and disenchantments. Of the many kinds of information flow, knowledge of pain is probably the most disturbing and paradoxical. In The Body in Pain, Elaine Scarry reminds us that “when one hears about another person’s physical pain, the events happening within the interior of that person’s body may seem to have the remote character of some deep subterranean fact, belonging to an invisible geography that, however portentous, has no reality because it has not yet manifested itself on the visible surface of the earth” (p. 3). Pain, she tells us, is not shareable; it is as if it could neither be denied nor confirmed. Wittgenstein had explained it previously: I cannot say that I feel your pain, but neither can I say that I do not feel that you have pain. There it is; that is what ultimately unites and reconciles us as humans, while at the same time separating us with a veil of mystery. It arises from the paradox that what most ties us to earth, the body we inherit from our mammalian evolutionary stem, becomes mysterious to us when we examine the phenomenology of our existence. Like many sensations and emotions, pain has no simple correlate in language. It is unsayable, however easily showable it may be in a scream, a facial expression or the curve of a back. And precisely because it is not directly communicable it becomes the subject of ritual and art, the domains where the invisible is made visible. They are not places of re-presentation where what is already common to us is imitated; on the contrary, they are spaces in which our concepts and recognitions of pain are constructed. So when the sentry guarding Polynices’s corpse informs the tyrant that Antigone wailed as a bird does on finding its nest empty, he is not describing but contributing to our understanding of Antigone’s pain in a way that her cry in itself would not be able to communicate to us, however much it might terrify us. In a very strict sense, Sophocles is a mediator between the skin and the way we understand certain kinds of pain. If art centres on the paradoxical nature of the emotions that make up the human condition it is because of its mission to educate humanity aesthetically, that is, to educate our sensibility so as to enable us to understand at the same time as we perceive with our senses. Art therefore illuminates the dark corners of existence, and by transforming material substance it transforms our understanding of the minds of others. In Lidó Rico’s work this role of art as a mediator producing transmutations in perception by shaping the inert is manifested with pellucid clarity. The fact that his own body is at once the instrument of creation and the model in many of his works refers us back to, and immerses us in, this mysterious paradox of representing pain. Lidó Rico sometimes works with his body, on his body and from his body. The body is his body and the expression is his expression, but along the way it has been estranged and frozen in a plastic material, which sometimes in-corporates (I should say “embodies”) organic bodies, giving rise to a kind of interpellation of the viewer: “listen, look, my body is your body, my pain is your pain, and we all share the same matter as dry leaves.” When we stand before works like Cuando el cuerpo quiere quedarse [When the Body Wants to Remain] we understand this strange fracturing of the human, which inherits the pain and emotions of its evolutionary organic material but is capable of turning a pure animal cry into a constellation of meanings through which we come to draw up a topography of our feelings at each historical moment. The body as a reality and as a symbol runs through Lidó Rico’s work in its manifestations of life and death. In Encrespados [Inflamed], the suffering body is confronted with the traditional symbols of death, in a kind of vanitas in which polyester and human hair are joined in a symbolic alliance: the organic and the technical, the living and the dead, passion and its expression. It is a fusion of materials that gives form to the tense content of a piece unfolding between paradox and recognition of the tragedy of the human condition. 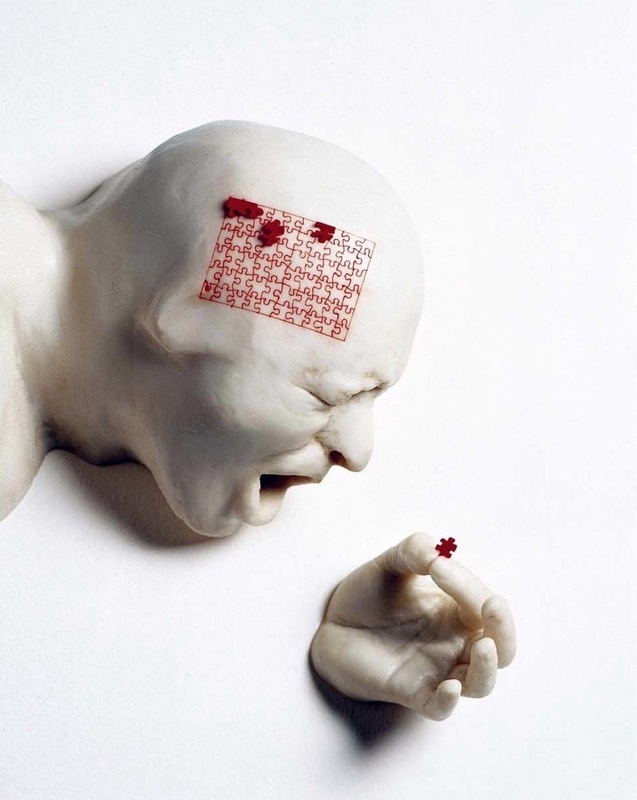 In Lidó’s works culture bursts upon the scene, turning the body into a battlefield, as in Estiramientos [Stretchings], a polysemous title alluding to the desire to survive, to overcome time, and to the exercising of violence on the body that has characterised the history of pain. Écorchés or flayings have been customary representations in the history of images to signify both a teaching purpose in anatomy and the infliction of the most unbearable pain that can be produced in another human being. Stretchings refer to that tradition of bodies turning on themselves in their contradictory life and death impulses. Orthogonally intersecting the epistemic paradox by which emotion is immediately understood and yet incommunicable in Lidó Rico’s work is another of the subterranean currents that fuel our contemporary culture, in which we give a name to the various feelings and emotional expressions of our bodies in the socio-historical contexts in which we happen to live. This is the foundational yet tense relationship between the technical and artefactual context in which our existence is played out and the subjectivities in which an understanding of what happens to us is manifested. The evolution of the human species took place under the pressure of forces that were not purely natural in origin. Previous species had already developed in artificial niches, products of culture, in which new evolutionary forces formed, and these forces selected the specific biological endowment of humans. In our species, the technical context is not something external that we inhabit, but something that has inhabited us from our earliest beginnings, producing our particular personal and group identities. The continuity between the body and the artefacts among which it is born, develops and dies is a defining feature of Lidó Rico’s work, as is his exploration of the suffering body. A new kind of exploration of the human domain is therefore added: a systematic examination of its hybrid nature between the natural and the artificial. Just as pain would not be expressible or comprehensible without the representations by which we give meaning to the pure cry, human cruelty and solitude would be incomprehensible without artefacts, which are the modes by which bodies are related, and even constituted. We speak of mental cruelty, as if cruelty could be purely mental and were not translated into material forms in acts and objects that cause harm. Equally, solitude is not mere isolation from bodies but a product of the walls erected by our artefacts, in the same way as a weapon, a telephone or a computer are bipolar relators that raise barriers to communication and paralyse the voice in their paradoxical function of conveying it. So we see this mapping of the contemporary world, which is the silent solitudes of its inhabitants, on the walls of the exhibition. Art is heir to religion in its ritual power produced through a material culture of spaces, icons, sculptural images and practices of self-absorption. Through their artefacts artists produce flows of consciousness which circulate among viewers, who are reconciled to their emotional condition while sharing the aesthetic experience. This production of sensibilities is what characterises art that is neither mere decoration nor staging. It pertains to what is most profound in our modes of relating: those that keep our communities united through gestures, objects, acts, abandoning their material function to acquire a symbolic function. Like the embraces and kisses with which we greet each other, to remind ourselves that our emotions remain intact, works of art rise above their materiality to the symbolic domain in which the most profound strata of human sensibility are produced and reproduced. An exhibition is always an exposing of bodies. The artist’s body is exposed and the viewers expose their bodies to the flow of relations generated by the works exhibited. It is a communal rite that reaffirms the highest part of human culture, in which we are reconciled to our position as fragile beings who entrust their existence to others. In this profound artistic sense, Lidó Rico’s work is pure exposure of bodies to their destiny of also being symbols of fragility in the presence of other bodies. Art and life are thus reconciled in their position as exposed beings. De las muchas cosas que es el cuerpo humano, una de ellas es la de ser a la vez una fuente de información y una barrera para la comunicación. Somos seres sociales y no simplemente gregarios porque nuestro cuerpo es una frontera por la que discurren los intercambios entre nuestras mentes: los estados, afectos, pensamientos, deseos y convicciones, proyectos, afiliaciones y lealtades, mentiras y traiciones, amores y desencantos. De los muchos flujos de saberes, el conocimiento del dolor es probablemente el más inquietante y paradójico. Nos recuerda Elaine Scarry (The Body in Pain) que “cuando se oye el dolor físico de otra persona podría parecer que tiene el carácter remoto de algún hecho subterráneo, perteneciente a alguna geografía invisible que, por más que sea portentosa, aún no se ha manifestado en la superficie visible de la tierra” (pg 13). El dolor, nos dice, no es compartible, es como si no pudiese ser negado ni pudiese ser confirmado. Wittgenstein lo había explicado antes: no puedo decir que siento tu dolor pero tampoco que no siento que tienes dolor. Está ahí, es lo que al final nos une y reconcilia como humanos a la vez que nos separa con un velo de misterio. Nace en la paradoja de que lo que más nos ata a la tierra, el cuerpo que heredamos de nuestro tronco evolutivo de mamíferos, se nos vuelve misterioso cuando se hace fenomenología en la que habitamos. El dolor, como le ocurre a tantas sensaciones y emociones, no tiene un fácil correlato en el lenguaje. No es decible, por más que sea tan fácilmente mostrable en el grito, el gesto o la curvatura de la espalda. Y precisamente por su incomunicabilidad directa se convierte en materia de lo ritual y del arte, que son los territorios donde se hace visible lo invisible. No son lugares de re-presentación en los que se imite lo que ya es común, por el contrario, son espacios de construcción de nuestros conceptos y reconocimientos del dolor. Así, cuando el guardián del cadáver de Polinices informa al tirano de que Antígona emitía gritos como los de un pájaro al descubrir vacío su nido, no está describiendo sino contribuyendo a nuestra comprensión del dolor de Antígona de un modo que su alarido, por sí mismo, no lograría comunicarnos por más que nos aterrorizase. En un sentido muy estricto, Sófocles es un mediador entre la piel y el modo en que entendemos ciertas formas de dolor. Si el arte se instala en la paradoja que presentan los afectos de los que está hecha la condición humana es por su vocación de educación estética de la humanidad, a saber, de esa forma de educación de la sensibilidad que permite la comprensión a la vez que la percepción sensible. El arte ilumina entonces los rincones oscuros de la existencia, y, mediante el recurso a la transformación de lo material, transforma nuestro entendimiento de la mente ajena. En la obra de Lidó Rico se manifiesta con luminosa transparencia este carácter de mediador del arte que a través del modelado de lo inerte produce transmutaciones en lo sensible. Que en muchas de sus obras el cuerpo propio sea el instrumento a la vez de creación y de modelo nos devuelve a, y envuelve en, esta niebla de la paradoja de las representaciones del dolor. Lidó Rico trabaja a veces con su cuerpo, sobre su cuerpo y desde su cuerpo. El cuerpo es su cuerpo y la expresión es su expresión, pero en el camino ha quedado extrañada y congelada en un material plástico, que a veces in-corpora (tendría que decir, “encarna”) cuerpos orgánicos, generando una suerte de interpelación al espectador: “escucha, mira, mi cuerpo es tu cuerpo, mi dolor es tu dolor, y todos compartimos la misma materia que las hojas secas”. Cuando nos ponemos frente a obras como Cuando el cuerpo quiere quedarse entendemos esta extraña fractura de lo humano que hereda el dolor y las emociones de su materia orgánica evolutiva pero que es capaz de convertir el puro grito animal en una constelación de significados por los que llegamos a levantar una topografía de nuestras emociones en cada momento histórico. El cuerpo como realidad y como símbolo recorre la obra de Lidó Rico en sus manifestaciones de vida y muerte. En Encrespados, el cuerpo doliente se confronta con los símbolos tradicionales de la muerte, en una suerte de vánitas en donde el poliéster y el cabello humano se unen en una alianza simbólica: lo orgánico y lo técnico, lo vivo y lo muerto, la pasión y su expresión. Una fusión de materiales que da forma al contenido tenso de una obra que se desenvuelve entre la paradoja y el reconocimiento de la tragedia de la condición humana. En las obras de Lidó la cultura irrumpe transformando el cuerpo en campo de batalla: Estiramientos, un polisémico título que hace alusión al deseo de pervivir, de superar al tiempo, y a los ejercicios de violencia sobre el cuerpo que han caracterizado la historia del dolor. Los ecorchés o desollamientos han sido representaciones usuales en la historia de la imagen para significar tanto la voluntad didáctica en anatomía como la inflicción del dolor más insufrible que se puede producir contra otro ser humano. Los estiramientos nos refieren a esa tradición en cuerpos que se vuelven contra sí mismos en sus contradictorios impulsos de vida y muerte. Ortogonal a la paradoja epistémica de la inmediata comprensión y al tiempo incomunicabilidad de la emoción, en la obra de Lidó Rico se entrecruza otra de las corrientes subterráneas que alimentan nuestra cultura contemporánea, en la que damos nombre a las diversas emociones y expresiones afectivas de nuestros cuerpos en los contextos sociohistóricos en los que nos toca vivir. Se trata de la relación constitutiva y a la vez tensa entre el contexto técnico y artefactual en el que discurre nuestra existencia y las subjetividades en las que se hace presente la comprensión de lo que nos ocurre. La evolución de la especie humana se produjo bajo la presión fuerzas no eran de origen puramente natural. Las especies anteriores se desenvolvieron ya en nichos artificiales, productos de la cultura, en los que se formaron nuevas fuerzas evolutivas que seleccionaron la particular dotación biológica humana. El contexto técnico no es en nuestra especie algo externo en lo que habitamos, sino que, ya desde nuestros comienzos, es algo que habita en nosotros produciendo nuestras particulares identidades personales y de grupo. La continuidad del cuerpo y los artefactos entre los que nace, se desarrolla y muere es un rasgo definitorio de la obra de Lidó Rico, como lo es también su exploración del cuerpo doliente. Se añade pues una nueva suerte de exploración del territorio humano: el del examen sistemático de su carácter híbrido entre lo natural y artificial. Del mismo modo que el dolor no sería expresable ni comprensible sin las representaciones mediante las que damos significado al puro grito, la crueldad y la soledad humanas serían incomprensibles sin los modos de relación, e incluso constitución, de los cuerpos que son los artefactos. Hablamos de crueldad mental, como si la crueldad pudiera ser puramente mental y no se tradujese en materializaciones en actos y objetos de producir daño. Igualmente, la soledad no es simple aislamiento de los cuerpos sino producto de los muros que erigen nuestros artefactos. Del mismo modo que un arma, un teléfono o un ordenador son relatores bipolares que levantan barreras a la comunicación, que paralizan la voz en su paradójica función de transportarla. Así, observamos en las paredes de la exposición esta cartografía del mundo contemporáneo que son las soledades mudas de sus habitantes. El arte hereda la religión en su poder ritual que se produce a través de una cultura material de espacios, iconos, imágenes escultóricas y prácticas de ensimismamiento. El artista produce a través de sus artefactos flujos de conciencia que circulan entre los espectadores, que se reconcilian con su condición emocional al compartir la experiencia estética. Esta producción de sensibilidades es la que caracteriza el arte que no es mera decoración ni escenografía. Pertenece a lo más profundo de nuestras modalidades de relación: aquellas que mantienen unidas nuestras comunidades mediante gestos, objetos, actos, que abandonan su función material para adquirir función simbólica. Como los abrazos y besos con los que nos saludamos, para recordarnos que nuestros afectos siguen intactos, las obras de arte se elevan desde su materialidad al territorio simbólico en el que se producen y reproducen los estratos más profundos de la sensibilidad humana. Una exposición es siempre una exposición de los cuerpos. Se expone el cuerpo del artista y los espectadores exponen sus cuerpos al flujo de relaciones que generan las obras expuestas. Es un rito comunitario en el que se renueva la parte más alta de la cultura humana, en la que nos reconciliamos con nuestra condición de seres frágiles que confían su existencia a los otros. La obra de Lidó Rico es, en este profundo sentido del arte, pura exposición de cuerpos a su destino de ser, también, símbolos de fragilidad ante otros cuerpos. Arte y vida, así, se reconcilian en su condición de seres expuestos.